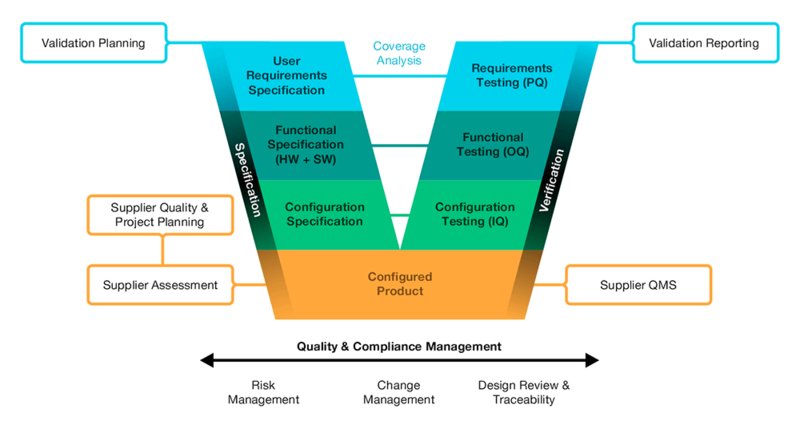 Pharma companies, suppliers of production devices (automation technology and control systems), and system integrators strive for Quality Assurance and risk management in pharmaceutical development projects. As a pharma Application Lifecycle Management tool, codeBeamer ALM provides a process-based project management system for pharmaceutical development. Intland’s Pharma GAMP® 5 Template is a preconfigured template that supports risk management and compliance with the requirements of the Good Automated Manufacturing Practice® 5. In the pharmaceutical industry production is highly automated and rigorously controlled. Distributed Control Systems and Production Automation systems are used to ensure hardware and software quality. The management of these critical elements is therefore crucial in the project from the design & project establishment phase and later in ongoing production in order to achieve high product quality, minimum waste, and compliance with regulations. codeBeamer ALM helps ensure optimal visibility on processes, as well as traceability and process control across the entire lifecycle. Due to extremely high production values, the risks involved in pharma projects are significant. There is considerable pressure to reduce waste in terms of time, materials, costs etc and to maintain consistently high product quality in a fast-paced market environment. While GAMP® is not a prescriptive method or standard, it builds upon existing good practice, and is therefore widely applied in the pharma industry. In order to establish a consistent focus on patient safety, product quality, and data integrity throughout the lifecycle, Good Automated Manufacturing Practice® 5 requires companies to adopt a risk-based approach to computerized systems compliance. Building a comprehensive approach to systems validation that covers the entire lifecycle, however, is an immensely difficult task in a complex pharma project environment. Intland’s Pharma GAMP® 5 Template leverages the wide range of capabilities and features of codeBeamer ALM, and supports the application of a risk-based approach to the management of compliant GxP computerized systems. It helps make sure that the systems used in pharma projects are fit for intended use and meet current regulatory requirements. codeBeamer ALM uses a single repository to store and manage all lifecycle data, providing gapless traceability, full change control & baselining, and rigorous process control all documented throughout the entire lifecycle. Its advanced risk management, quality assurance, and reporting features help you tackle compliance audits with ease. To request an evaluation version of the template, please complete this simple request form. You’ll get an e-mail with a brochure and further information on using the template. In an environment as complex as any pharmaceutical development project, being able to manage and monitor tasks, processes, and to ensure efficient collaboration is a challenge. Staying in control is vital. codeBeamer ALM’s collaborative features are leveraged by this template’s Roadmap configuration items (which let you plan, visualize, and manage releases using Gantt charts), Timekeeping tracker (with records about individual working time spent on work items), and Team management functionality. Real-time reporting features help ensure adherence to the Project and Verification Plan. As any and all changes are logged and documented on all items, and relations may be easily established between them, gapless traceability is ensured from specifications all the way through to release. The Traceability Browser lets you simply visualize links between artifacts, and easily pull & export traceability reports for compliance audits. After the finalization of all specs & requirements, Tasks may be added and their execution closely monitored. A System Modules tracker helps keep track of hardware and software components of the Automation System environment, ensuring traceability for System Configuration Specification tracker items (SCS) and related tests. Application Module Type and Application Module trackers help the process of development, while Software Integration trackers let you manage configuration environment data. Workflows may be simply defined and enforced throughout the pharma project’s lifecycle. Sophisticated approval processes may be implemented and all review activity logged using codeBeamer’s Review Hub (which may be purchased as an add-on). Electronic signatures are compliant with Title 21 CFR Part 11, and are therefore trustworthy, reliable, and equivalent to paper records as per FDA guidelines. codeBeamer’s sophisticated risk-related features help implement adequate quality risk management processes that GAMP 5 calls for. An FMEA Risk tracker contains all the failure modes and risks discovered during the risk assessment process. The discovered risks may generate further work, of which you can keep track in a traceable manner using Risk tasks. An FMEA worksheet lets you oversee and stay in control of your risk management processes. To ensure bulletproof QA processes, Intland’s Pharma GAMP® 5 Template leverages a variety of features, trackers, and processes. To ensure adherence to the Project and Verification Plan, an Observations and Deviations tracker helps fix the root causes of unacceptable test results. A full change history is provided on all items throughout the entire lifecycle. Change Controls enable the management of requirement items modified after their initial approval or indirectly as a consequence of detecting deviation (OD) during test procedures. Several types of GAMP®-compliant test trackers help you define, manage, and monitor testing activities. Wikis can be collaboratively edited and managed to ensure access to up-to-date information for all stakeholders throughout the pharma lifecycle. codeBeamer’s document management features let you share documents with meticulous (timestamped) change control ensured. codeBeamer saves a detailed history of all your artifacts (including workflows and assignments) so that all changes are traceable. Baselines let you save a snapshot of the current state of your project with all its artifacts, workflows, comments, tasks, etc. Using baselines, you can simply browse or compare previous versions at any point in time. This provides compliance auditors and other internal and external stakeholders a comprehensive overview of each version or release. Stay in control of, and report on all lifecycle processes using this template’s preconfigured, real-time reporting dashboards. Dedicated reports are available for risk traceability and code traceability, as well as requirements (by status, assignee, business value, etc). Release Gantt charts, activity trends, burndown charts and others help you monitor development even in a complex environment. Your QA team can oversee the progress and success of all testing activities using Test Management reports available out of the box. codeBeamer’s Review Hub (which may be purchased as an add-on) lets you build custom reports with real-time data updates, and automate the sending of these to specified e-mail addresses. GAMP® is a powerful and comprehensive guide that covers all aspects of computerized systems good practice and compliance throughout the lifecycle. The risk-based approach it applies is in line with EU EMA and US FDA regulations, and is meant to ensure patient safety, product quality, and data integrity. The goal of verifying the processes and tools used during the lifecycle is to ensure that the system functions as intended. Requirements and specifications are used as the standards to which to test the system. Essentially, tests are traced back to requirements and the specifications that the activity being tested aims to verify. Intland’s Pharma GAMP® 5 Template leverages the market-leading capabilities and integrated database of codeBeamer ALM to ensure gapless traceability, adequate risk management, and audit-proof documentation throughout the entire lifecycle of pharma projects.